Dr. Arnold Mitchem, President Emeritus of the Council for Opportunity in Education, has been a voice for low-income, first-generation students and individuals with disabilities his entire career. Thanks to his work, the federally funded TRIO Programs have expanded by nearly 400% and now serve more than 872,000 students at 1,200 colleges and universities. He began his career on the History faculty at Marquette University in Milwaukee and was named the Director of the Educational Opportunity Program in 1969. 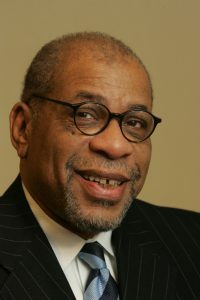 He relocated to Washington, D.C. in 1986 to serve as President of the Council for Opportunity in Education until October 2013. Dr. Mitchem has been awarded Honorary Doctorates from eleven universities: CUNY-Lehman College in New York; DePaul University; University of Illinois, Champaign-Urbana; University of Liverpool, England, Marquette University; Marycrest College; University of Massachusetts at Boston; Lewis University; St. Joseph University in Philadelphia; St. Louis University; and SUNY Buffalo State.